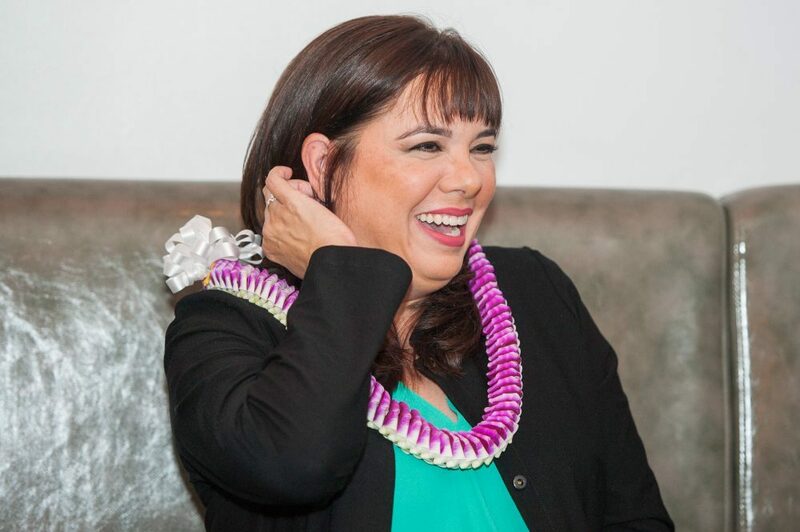 Lee Cataluna is a metro columnist for The Honolulu Star-Advertiser. Before moderating a Smithsonian/Zócalo “What It Means to Be American” panel discussion in Honolulu, supported by the Daniel K. Inouye Institute, entitled “Does Hawaii Have America’s Strongest Sense of Identity?” she chatted in the green room about fireworks, dining with Gershwin, and traumatic piano recitals. Would you like to learn one? No! I played piano as a kid. Lots of trauma. From the recital, from that total blackout moment at the recital. If you could have a beer with anyone, living or dead, who would you pick? You know, I was just listening to that Brenda Russell song “Dinner With Gershwin.” Donna Summer did the version that we all know of it. And I want to meet all those people in the song: Gershwin, Rembrandt, Picasso. I love the feeling of that song. What would you talk about with those people; what would you ask them? I’m a reporter, I like one-on-one. I’m a super introvert. I wouldn’t have guessed that. I know; I fake it all the time. The dinner party thing scares me. I like one-on-one. I’m very interested in people, I just don’t want to have to run the gauntlet of the cocktail party to have to talk to them. Do you have a favorite 20th-century writer? John Steinbeck. He can describe a place that you’ve never seen and make you feel like you’re standing right there with him. Because his characters are so understandable, their flaws are so lovable. His writing is poetry without being overbearing. And also the Anglo-Irish playwright Martin McDonagh. He has that funny violence. He’s really fresh, and he handles it so beautifully. I kind of just fan-girl around him. Is there a Hawaiian writer who does for these islands what McDonagh does for Ireland? Me! Hawaii is one of those places that people come into from the outside, and because it’s small they think, “I’ve got it, I understand it.” And then they write about it. And because they have connections, those stories are told outside Hawaii. And it’s often from an outsider’s point of view. And there are stories and works of literature that are generated locally and stay locally, that are super-authentic, and this is where their readers are and their audiences are, but they don’t quite match up with this outsider point of view on Hawaii. One of my favorite playwrights is Ed Sakamoto. He worked for the L.A. Times, he was a copy editor, but he was also a playwright and he wrote about growing up in Hawaii, and his stuff is just amazing. Was there a teacher or professor who really influenced you or even helped to set the course of your life? Did you follow her advice? I did. Her point was, you know the people from Hawaii. If you don’t know specifically those people from Hawaii, you can meet them in the hall. But don’t hang out with the people you grew up with; hang out with new people who come from a different place and a different culture. And she said the first thing you have to do when you get to college [on the mainland] is make friends with somebody who lives nearby who will take you home for Thanksgiving. Absolutely, because Thanksgiving is so completely different in different cultures. In Hawaii we serve rice—and turkey and gravy. But if you don’t have rice, that’s really hard for Hawaiians to deal with. We have the standard stuff, but we have a few extras. Is there a special Hawaiian holiday that’s only celebrated here? We have Prince Kūhiō Day, after Prince Jonah Kūhiō Kalanianaʻole, who was our first delegate to congress. And we have Kamehameha Day to honor our first king. And New Year’s is huge in Hawaii, in a way that I don’t think it is in other places that don’t have as much Asian influence. What do they do here to celebrate? Set off illegal aerial fireworks! By the truckload! It’s insane! What’s the one thing you’d like to tell us outsiders about Hawaii? Hawaii is not easy to know, and that’s one of the cool things about it. There’s always another mystery, there’s always another secret, there’s always another miracle or discovery.